Over the past three decades, more and more Syrians have relocated from the rural areas to major cities seeking employment opportunities that became scarce in geographies where agriculture is the main source of income. But once these locally migrating populations arrive in the city, they get introduced to the un-affordability of the real estate market and get pushed towards the periphery of the city. At the peripheries, informal settlements have grown and been bypassed by the ever growing metropolis urbanity. As time passed, scattered micro ‘slums’ became multi-story concrete blocks in dense working-class informal neighborhoods built up gradually by the effort of their residents. What was found as a temporary solution for housing shortage and the affordability crisis in the 80s, went on to become long-term housing typology for those unable to make the move into the city, and developed a unique social and economic resilient structure that often operates independently from government services and systems. The unregulated history of the informal settlement typology has been often utilized to justify the marginalization of these settlements, and their inequitable access to resources, like water and electricity. This reality puts settlements, like that of Barze among many others in western Damascus suburbs, in a fragile condition facing a rapidly changing climate in the region with less and less support from the Syrian government even before the revolution and the war. Less affluent neighborhoods and built up refugee settlements around Damascus, are the most affected by the crisis of water scarcity in Syria as the government struggles to provide citizens with constant supply of freshwater. Contradictorily, these same populations are the most affected by floods, torrents, landslides, and the collapse of their structures happening every year during the rainy season, which has become shorter and more extreme in the past decade. 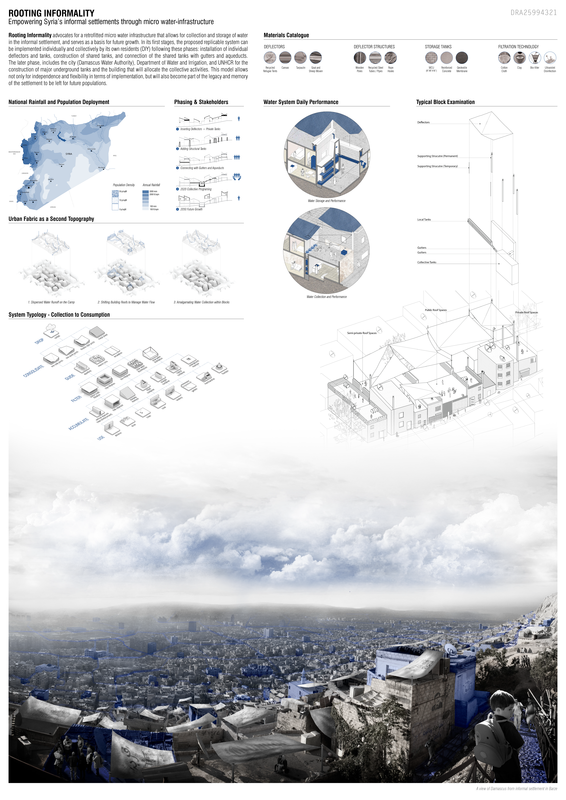 In a regional context of dependency and subordination under which the informal settlements of Damascus exist, The Rooting Informality project utilizes the irregularity and extreme density of the Barze settlement to create an adequate and independent rainwater collection system that has the capacity to empower the population towards sustainable access to resources beyond regional limitations. The project aspires to fill the water shortage gap while providing structural basis for future vertical growth for the informal settlement in the dense city of Damascus. Through a system of decentralized micro-water collection and storage units, the project aims to create an extended network of reservoirs embedded in the built fabric. Within this context, the urban fabric performs as a second topography that can be molded and reshaped through various interventions ranging from the use of elevated light structures that capture and divert the flow of water, to the provision of storage facilities. The proposed system consists of storage tanks that are interconnected by aqueducts and gutters to assure an equal distribution of the collected water as it overflows from small-scale individual tanks on the roofs into more collective reservoirs in the ground. The sequential overflow of water leads to an underground tank located in the lowest point of the newly reshaped-topography, which also becomes a point of “water revelation“ through a collective usage of water happening in the programs above it. According to the course of the day and the needs of the neighborhood this community space is flexible enough to allocate different programs like common kitchens and gardens, places for meetings and children to play, kindergartens, medical assistance, ablution, weddings, mourning, among others. The single settlement scale cohesion is achieved through the network of the different social spaces, also physically connected, following the topography by their underground tanks. The final goal would be to expand this network to other informal settlements at the city periphery. Thus, the proposed water collection and storage extends its value beyond the functional infrastructure to become an element of finding and activating much-needed open spaces for gathering and social interactions across the settlement and the city of Damascus. Acknowledging that the growth of our cities implies the increment of the population living in informal settlements, the adaptability of this water system to other contexts implies a regional impact that in the case of Syria would be reflected in the relief of its continuous effort to bring fresh water to urban areas through expensive mega projects. ​ Rooting Informality advocates for a retrofitted micro water infrastructure that allows for collection and storage of water in the informal settlement, and serves as a basis for future growth. In its first stages, the proposed replicable system can be implemented individually and collectively by its own residents (DIY) following these phases: installation of individual deflectors and tanks, construction of shared tanks, and connection of the shared tanks with gutters and aqueducts. The later phase, includes the city (Damascus Water Authority), Department of Water and Irrigation, and UNHCR for the construction of major underground tanks and the building that will allocate the collective activities. This model allows not only for independence and flexibility in terms of implementation, but will also become part of the legacy and memory of the settlement to be left for future populations.